While we are enjoying our short spring here in North Texas, we all know that the heat of summer is not far away. Once the Texas temperatures begin their annual climb, you may find yourself wondering how to keep cool and keep the kids busy after school is out. Already have a pool in the yard? Maximize your outside time with a new pool house. Not ready to build an entirely new structure? You can turn an existing garage or shed into a pool house that will provide plenty of space for storage and entertainment. How much space will you need for your pool house? An average one-car garage would be about 22 feet by 12 feet giving you approximately 264 square feet to work with. This kind of space will offer you room for a small bathroom, storage, and a little more room to play with. A fully outfitted pool house would have a shower and bathroom to keep those wet feet and towels out of the main house. A simple standing shower stall would be sufficient and you would only need about 16 square feet for this set up. You could certainly make the pool house more luxurious with a soaker tub or Jacuzzi spa, especially if you were remodeling a larger garage. Don’t forget about the doors and windows. A sliding barn door would offer an attractive entryway that could easily be matched to the main house exterior. Sliding glass doors with tempered glass would be a functional way to let lots of light in. Tempered glass offers more strength than regular glass and will provide a solid barrier with the outside and offer some insulation from the summer heat. It can actually feel 10 to 15 degrees cooler in the shade than in direct sun and adding a shaded space offers a way for you to avoid overexposure to UV rays. Enjoy the outside of your pool house by adding a pergola, retractable sunshade, or permanent awning to it. Pergolas are a great way to add dimension and character to an outside space and offer a bit of sun protection. For more coverage, a retractable sunshade or permanent awning is optimal. 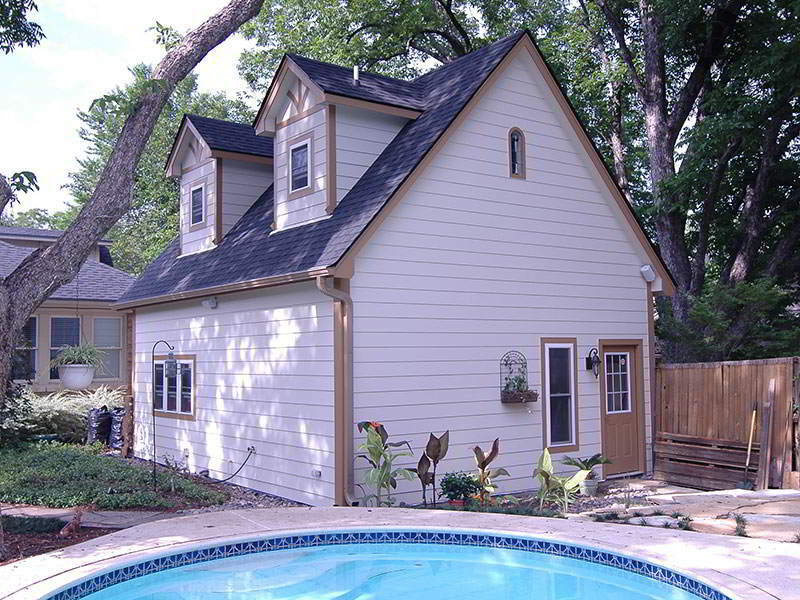 Again, both can be customized with materials and colors to match your existing exterior design. Whether you’re looking for a simple pool house to keep the pool toys in check, or a fully equipped outdoor entertaining space, give us a call to start the planning and construction now so you can enjoy your pool and outdoor space all summer long.